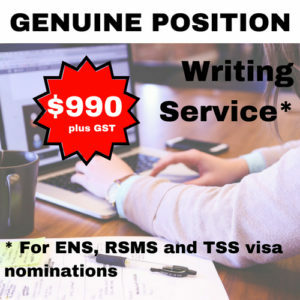 The Genuine Position Writing Service assists applicants for TSS, ENS – 186, RSMS – 187 visa nomination applications. Nomination applications for TSS, ENS/RSMS visas are the most strictly assessed parts of the visa application process. Failure to adequately demonstrate the need for the position being nominated will result in nomination application failure. The Genuine Position Writing Service will format the submission to the department of Immigration in support of your application. The criteria for pass or fail will be addressed in turn so as to maximize success prospects and minimize the risks. Who will write your Genuine Position Statement? The genuine position writing service will be provided by a registered migration with expertise in skilled, employer sponsored and business visa applications. To order the service, simply purchase online. Once payment is verified, one of our migration specialists will be in touch with you to commence preparation of your Genuine Position Statement.